[ 'Andre Massena, Baron de Camin', anti-Catholic rabble-rouser. ] Printed anti-Catholic handbill headed 'Popish Malice. | To the Protestant Inhabitants of York and its Vicinities.' With Autograph Notes by Massena and 'W Haty' of Sunderland. The handbill printed by 'Geo. Hesk, Printer, "Standard Office," 29, Scale Lane, Hull.' Haty's note dated 7 April 1860. Theodore Hoppen, in his 'The Mid-Victorian Generation', refers to a 'growing band of anti-Catholic lecturers who toured Britain in the 1850s and 1860s', adding that most 'were rogues like the former Dominican, Giacinto Achilli, and the soi-disant Baron de Camin. Almost all depended financially upon admission fees. Their lurid handbills advertised travesties of the mass, "the secrets of the confessional", and "wafer Gods" to be "sold at 1d. each at the doors".' See also Paul Colman Mulkern, 'Irish immigrants and public disorder in mid-Victorian Britain, 1830-80'. [ Walton Adams, pioneering photographer and British Israelite racist. ] 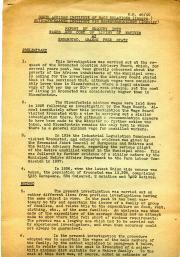 Collection relating to the Second Coming of Christ and the Great War, including typescripts and drafts of 21 articles, autograph notes, cloth map, model of the Great Pyramid. Dolwyn, Kidmore Road, Caversham, Reading, Berkshire, and Delamore, Parkstone Avenue, Lower Parkstone, Dorset. One article dated 20 August 1917, and the others from around the time of the Great War. The collection consists of 21 typewritten articles, with some drafts of the same; two folders of miscellaneous typed and autograph texts, a cloth map, a folding card model of 'The Pyramid' and a diagram of the 'City & Temple to scale'. BACKGROUND: Walton Adams, the founder of a family of notable British photographers and artists, including his son Marcus (1875-1959) and grandson Gilbert (1906-1996), was at his death 'believed to be the oldest professional photographer in the country' and 'the first photographer to use dry plates' (see his obituary, Times, 15 June 1934). 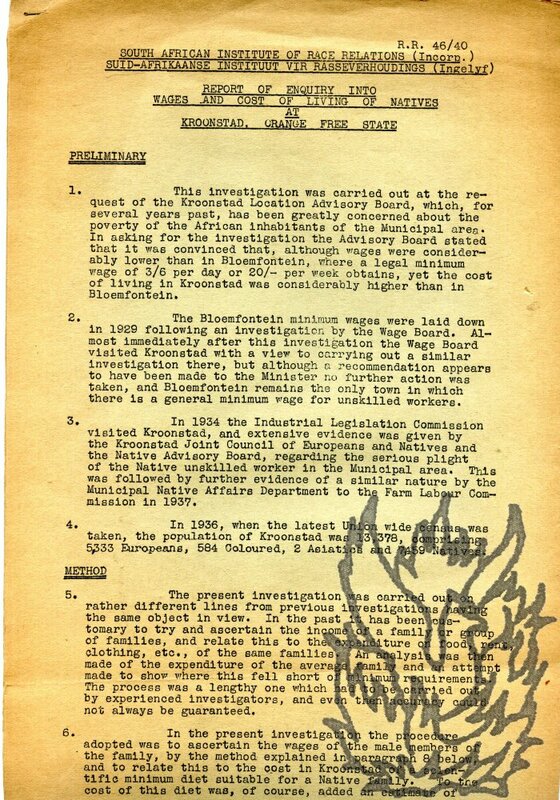 A collection of around 150 items relating to the anti-apartheid struggle in South Africa, and African revolutionary politics, including booklets, periodicals, newspapers, handbills and circulars, from the papers of South African activist Basil Stein. Most of the items published in either South Africa or London, England. The majority dating from the 1960s, with a few from the 1950s and 1970s. Upwards of 150 items, in good condition, on lightly-aged paper. In two parts, with Part One (around 100 items) relating directly to the anti-apartheid struggle, and Part Two (around 50 items) to broader African revolutionary politics. Part One includes 16 booklets from the 1950s and 1960s: 'Nelson Mandela versus the State'; 'The Unholy Alliance. Salazar, Verwoerd, Welensky'; S. Abdul, 'The Truth about South Africa'; 'Sing Free South Africa'; 'What can I do? A Guide to Action Against Apartheid'; I. B. Tabata, 'Education for Barbarism'; Leslie Rubin, 'This is Apartheid'; H. E.
Union of South Africa. Department of Native Affairs. 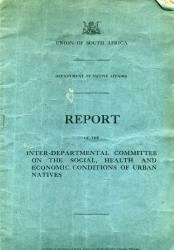 Report of the Inter-Departmental Committee on the Social, Health and Economic Conditions of Urban Natives. Folio, 30 pp. In original blue printed wraps. Stapled. Text clear and complete. On discoloured, frayed and creased paper. Ownership inscription of A. Copeman, Cambridge. Only copies on COPAC at the British Library and University of London SOAS. Report of Enquiry into Wages and Costs of Living of Natives at Kroonstad, Orange Free State. Folio, 13 pp. Mimeographed typed document on seven leaves stapled together at head. Some leaves separated. Text clear and complete. On aged high-acidity paper with slight chipping to extremities. 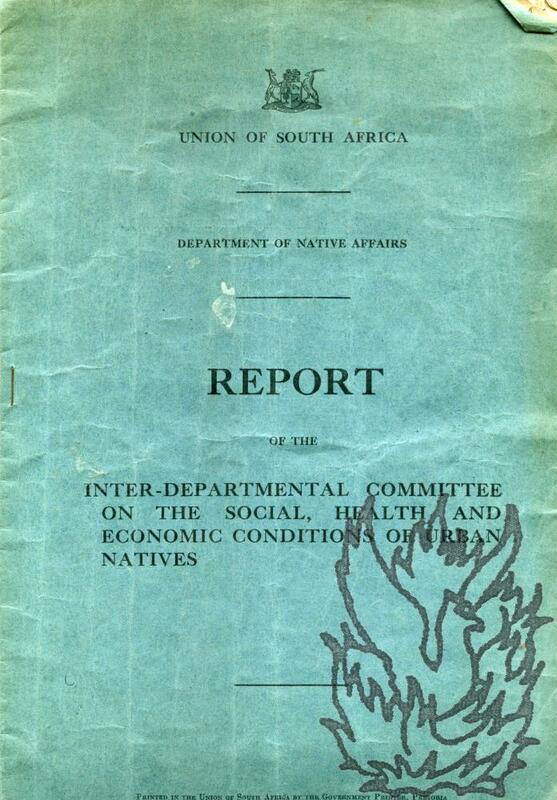 Report over first seven pages, followed by two appendixes: 'Minimum Diet for Urban Bantu Family of Husband, Wife and Three Children and Cost thereof in Kroonstad' and 'Occupational and Wage Statistics'. No copy on COPAC or in the British Library. Autograph Letter Signed ('F. Madras.') to 'My dear Venables'. 14 April 1871; 56 Friar Gate, Derby. 12mo, 2 pp. 24 lines of text. Good, on lightly-aged paper. Laid down on a leaf from an album, in such a way as the first line of the second page can only be read in mirror image by holding the item up to the light. Marvellously indicative of the patronising attitude of the governing British classes to their Indian subjects. On visiting Venables he will 'venture to bring with me my native servant' who 'does not require much in the way of accommodation'. If Venables 'has no corner for him' in his house, asks if he can recommend 'a little room somewhere near'. Typed Letter Signed ('Cyril Burt') to 'Mrs. Place' [i.e. Mrs G. M. Place, of the publishers Pitman]. 12 October 1932; on letterhead of 4A, Eton Road, Hampstead, NW3. 4to: 2 pages. 37 lines of text. Text clear and entire on slightly discoloured paper, lightly worn and creased and with a few nicks to extremities. Signed properly on the second page. Place's essay, apparently a biographical account of the psychological development of a very young child, 'whiled [sic] away a long train journey last night very pleasantly'.